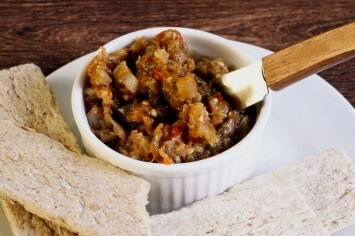 This is such a wonderfully healthy eggplant dip recipe. It combines the flavors of the Mediterranean, including eggplant, garlic, tomato, lemon juice and olive oil. Just add a bit of freshly ground pepper and some salt and you have a very healthy appetizer or snack recipe. This is a very versatile recipe. You can serve it with raw vegetables to use as dippers or serve it with crackers, fresh crusty bread or toasted baguette slices. You can also serve it over hot quinoa or couscous. Use your imagination and get these healthy flavors working for you. Poke the eggplant in several places with fork. Place it on a baking sheet and bake in the preheated oven for 45 minutes or until soft, turning once or twice during baking. Let the eggplant cool, then peel it and chop finely. Meanwhile, saute the garlic, celery, green pepper and tomatoes in a bit of oil for 4 or 5 minutes or until they soften. Add the chopped green onions in the last minute of cooking. In a mixing bowl, combine the eggplant, onions, garlic, tomato, celery and green pepper and toss to mix them all together. Add the lemon juice, oil, salt and pepper. Stir to mix well. Cover and refrigerate the dip for at least 1 hour before serving for the flavors to meld. It is important to remember to poke the eggplant with the fork because the fork holes allow steam to escape while the eggplant cooks. If you don’t allow for that, the eggplant could build pressure inside as it cooks and explode all over your oven. Not pretty. This easy vegetable dip can be served either warm or cold. 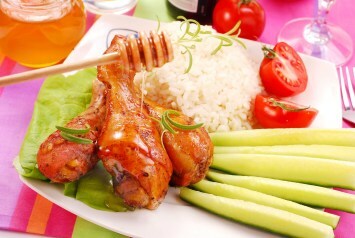 If you want to serve it warm, leave it at room temperature, then just reheat it a bit before serving. I would suggest serving it with raw vegetables, or grainy crackers, but toasted pieces of baguette would be wonderful too. Try something different – serve this eggplant vegetable mixture over hot quinoa or couscous for a vegetarian side dish or main course. The original recipe calls for green peppers, but of course you can substitute red, orange or yellow peppers if you prefer. You can even use a hotter pepper if you want a super hot dip. It may be a good idea to use a bit of hot pepper, but not the entire 1/4 cup. Add a touch of hot sauce if you want to amp up the heat level a bit (or a lot). As party foods go, this is a wonderfully healthy recipe. Yes you can have fun and eat healthy at the same time. This eggplant dip recipe is a great example of that. This veggie dip is a great example of a healthy Mediterranean diet recipe. It combines the amazing flavors of Mediterranean vegetables with a lemon juice and olive oil dressing. Simple, full of wonderfully healthy nutrients, and best of all, it tastes wonderful so family and friends will be glad to eat it up. Plus, look at the nutritional information in the blue box above. This recipe is low in calories and fat (and the fat that is contains is very healthy from the olive oil), and low carb. It fits into almost any healthy eating plan just perfectly including gluten-free. It is also a wonderful diabetic recipe. If you like this eggplant dip recipe, browse all of our dips and appetizer recipes here. You will find all of our Italian inspired recipes here.